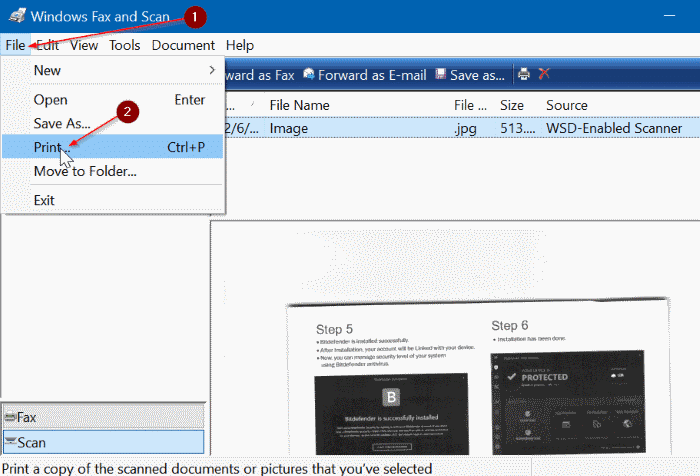 Want to scan a document and save it as a PDF file on Windows 10? Don’t want to use third-party programs to save scanned pictures or documents as PDF? In this guide, we will see how to automatically save scanned files as PDF with ease. 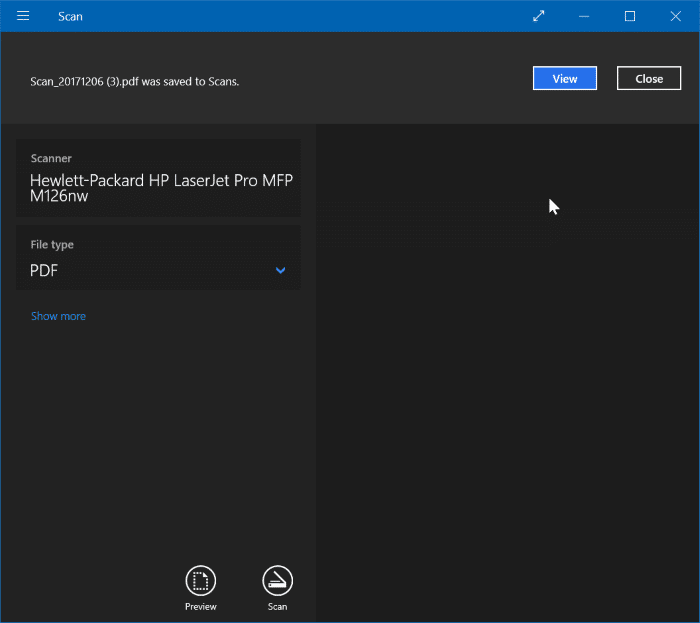 As with the case of its predecessors, Windows 10 also has a built-in Fax and Scan program using which one can use scan files by connecting Windows 10 PC to a scanner. The built-in Windows Fax and Scan program is a legacy desktop program but does its job well. The only problem with Windows Fax and Scan is that it cannot save scanned files in PDF or portable document format default. But there is a workaround to save files as PDF after scanning documents and pictures using Windows Fax and Scan program. 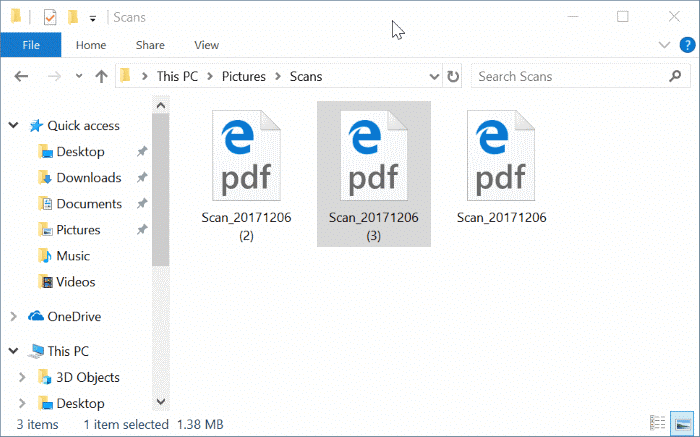 Additionally, you can also use new Windows Scan app from Microsoft to automatically save scanned documents and pictures as PDF. 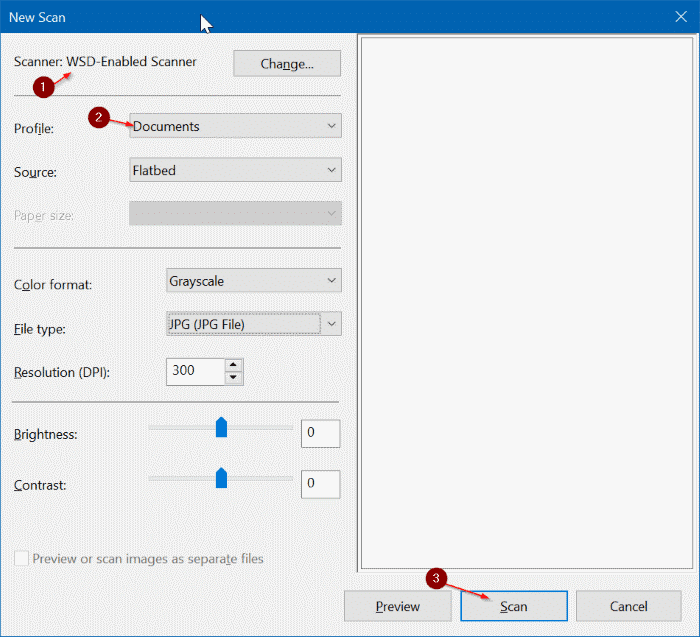 In addition to PDF, the Windows Scan app enables you to save scanned files in JPEG, PNG, TIFF, Bitmap, OpenXPS, and XPS formats. In this guide, we will see how to use Windows Fax and Scan and Windows Scan to save scanned documents and pictures as PDF. Step 1: Open Windows Fax and Scan program. Click New Scan button in the toolbar. Step 2: View or select a different scanner by clicking Change button in the Scanner section. Step 3: In the Profile section, select the type of the file that you are going to scan as either Photo or Documents. Change other default settings, if you want. Step 4: Click the Scan button to begin scanning the hard copy in the scanner. Step 5: Once the scanning is completed, click the File menu and then click Print option. Yes, we are going to save the file as PDF. 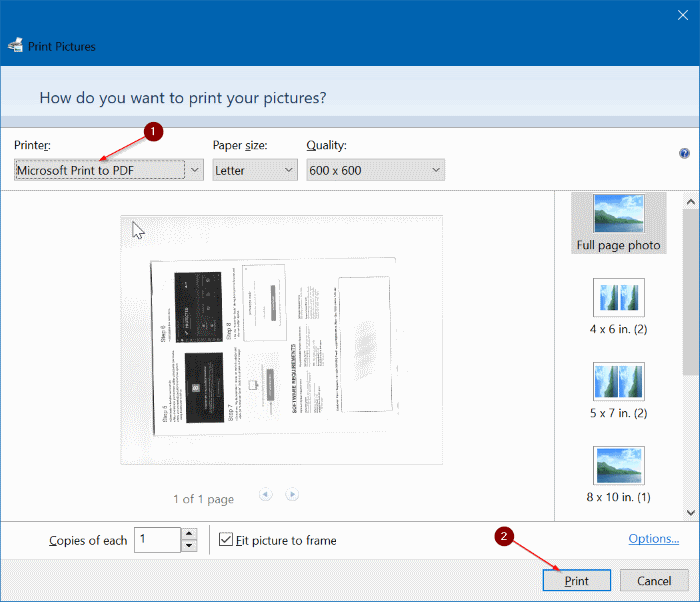 Step 5: When the Print dialog, select Microsoft Print to PDF from the printer drop-down box, and then click Print button. 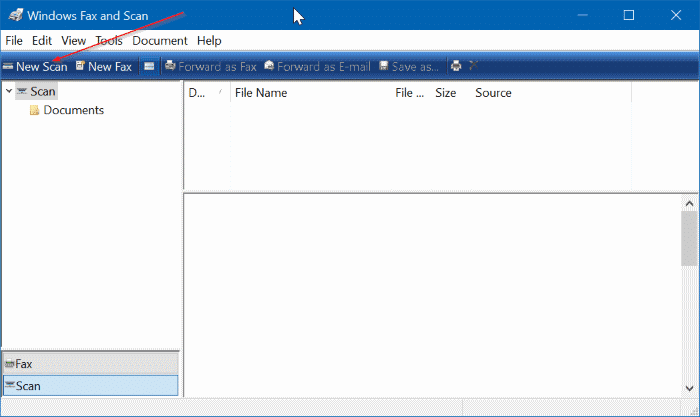 Step 6: At the Save Print Output As dialog, enter a name for your scanned file, select a location to save the file, and then click Save button to save it as PDF file. That’s it! 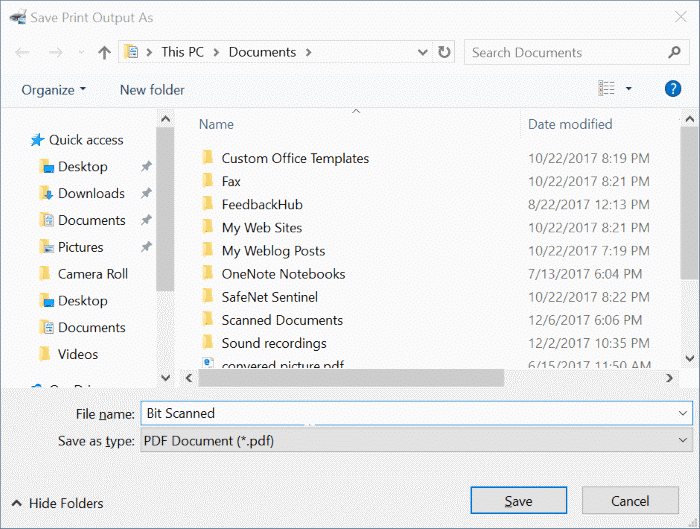 Here is how to use Windows Scan app to save scanned files in PDF in Windows 10. 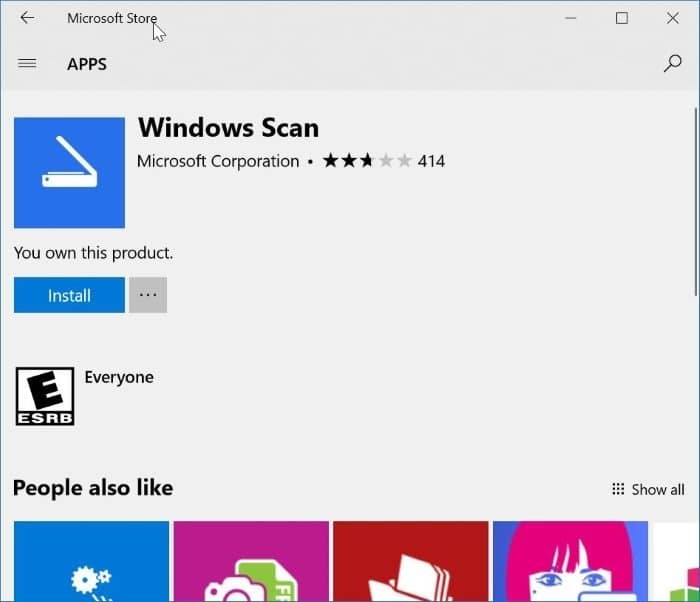 Step 1: Check if Windows Scan app is already installed on your Windows 10 PC. If not, visit Windows Scan page in your web browser to automatically open the page in Windows Store app. Install the app. Step 2: Turn on the scanner, if not already done. Step 3: Open Windows Scan app. Note that Windows Scan, and Windows Fax and Scan are two different apps. You need to open Windows Scan app. 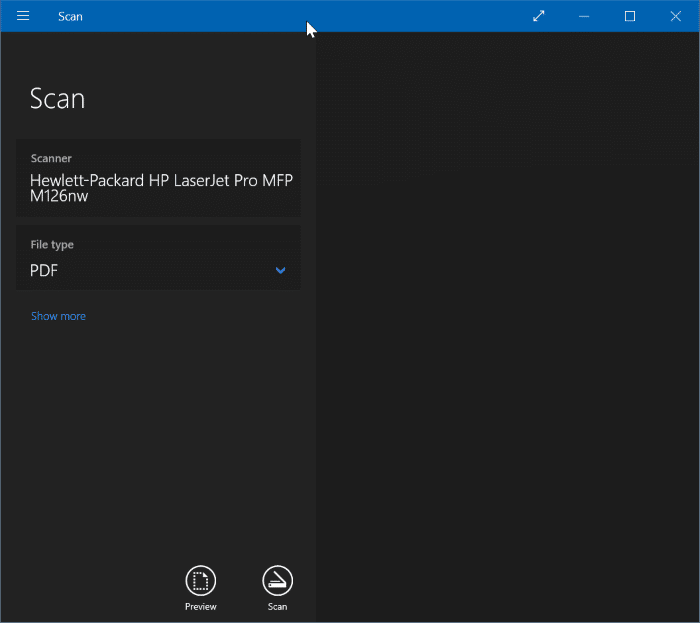 Step 4: The Windows Scan app should automatically detect your scanner. If two or more scanners are found, please select the one that you would like to use now. Step 5: In the left-pane, just below the scanner now, you can see the file type box. Select PDF option. Step 6: Finally, click the Scan button to begin scanning the paper in the scanner. Note that you can also preview before scanning by clicking the Preview icon. It will also display a small banner once the scanning is completed with an option to View the scanned file.